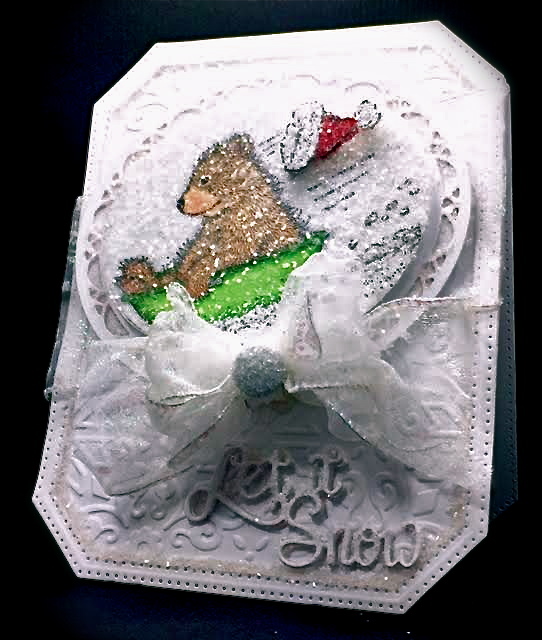 I've got a NEW Winter card for my "ALL White" House-Mouse Challenge, #HMFMC206, found over at HMFMC. Check it out HERE. I've used an adorable Stampendous! 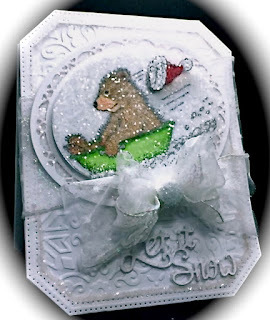 HMD Gruffies stamp called; "Sledding Santa"
Lots of shimmer and only a few layers make-up this fun card. HOPE YOU CAN JOIN US for this challenge at HMFMC! Offering one Lucky player a $20 Gift Certificate to House-Mouse Designs. Yours truly is hosting and I've got another fabulous Mousey package to give away to a lucky player - so be sure to enter a project for your chance to win this! Stop by Creative Expressions to see Sue Wilson's Fabulous Craft Die Collections HERE. Stop by the House-Mouse BLOG for details and more wonderful inspiration from the amazingly talented Mousey Designers HERE. Thanks for visiting today! I love hearing from you! Hi America this is one beautiful card and I love your design. As always a gorgeous card. This is truly so lovely l love the glitter and the layout of your wonderful card so beautifully presented too! A gorgeous card America - I love the white on white with a super design and fabulous die cutting and a beautifully coloured the adorable sparkling Gruffie!! Wow America!! This is gorgeous...so very effective in the white...your Gruffie is simply fabulous!! And YAY I can finally get my comment to stick...lol!! Have a wonderful day!! I love the blizzard you created for the Gruffie to have fun sledding in. Gorgeous white on white, becautiful dies and layout. That's a gorgeous card! I love your design. Have a great week! Well he's one brave bear going out in such bad weather, but, he sure looks to be have fun. Loved the White on White Challenge. What a fun card Love your design.